Rolling out for Spring 2013, HJC has loosed a few goodies that they have been hiding up their sleeves. We saw a sneak peek of the HJC FG-17 yesterday and look forward to the HJC FG-JET today. 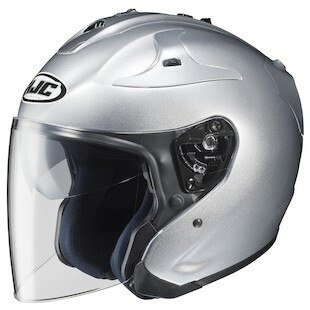 A lightweight open-face helmet with internal sunvisor, the HJC FG-JET Helmet settles in well under $200. Packed with creature comforts, this fiberglass 3/4 option comes with a moisture-wicking, antibacterial, and odor-free interior. The optically correct faceshield uses HJC's HJ-17R Shield with quick change system, while the sunvisor implements their patented one-touch retraction system. Some of the recent improvements we've seen from HJC in ventilation are also carried forward onto the FG-JET. Starting colors will include Black, Matte Black, White, Silver, and High-Viz.